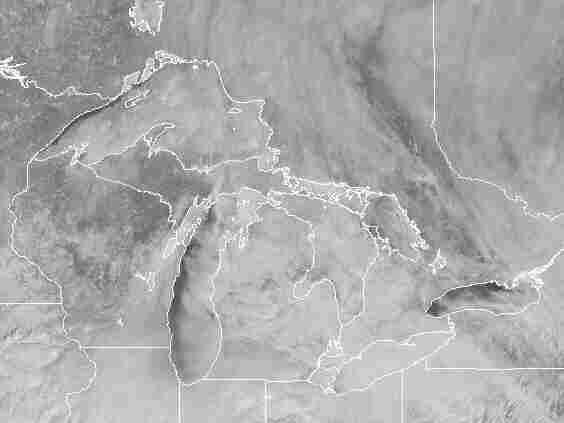 Even From Space, Near-Record Ice On Great Lakes Is Chilling : The Two-Way This winter's extra-cold temperatures mean that nearly 90 percent of the five lakes' total surface area is covered with ice. That's approaching the record high of nearly 95 percent, set in February 1979. Satellite images help tell the story. 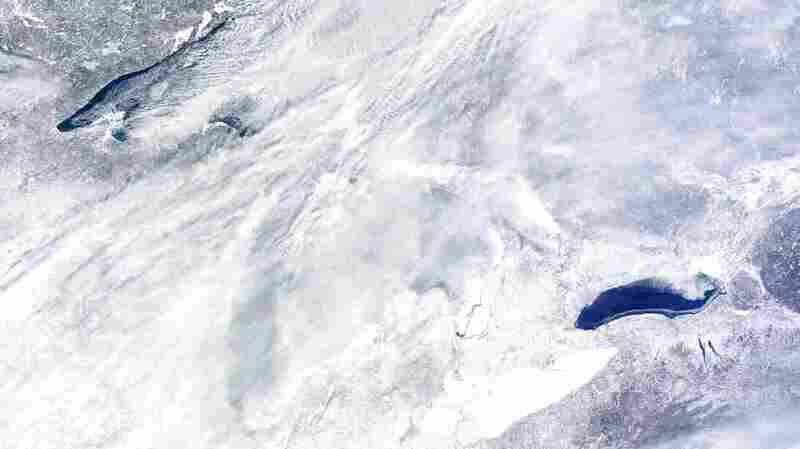 They're down there somewhere: The Great Lakes as seen from space on Wednesday. Lake Ontario, which has less ice than the others, is at the lower right. A bit of open water can be seen in Lake Superior, at the upper left. 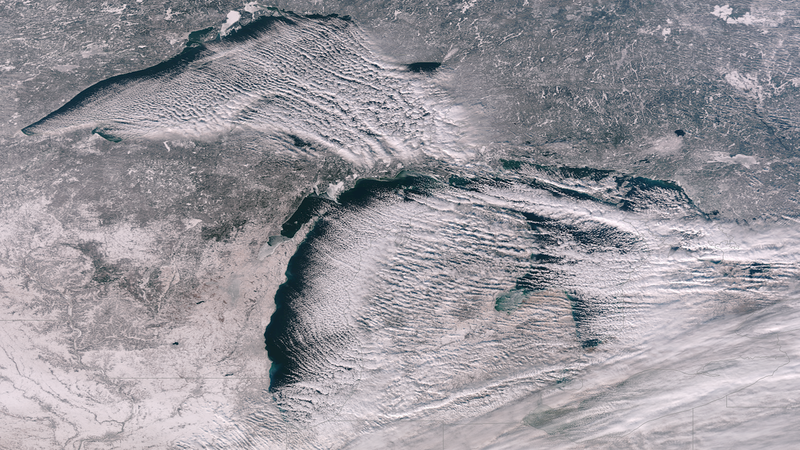 The satellite photo we posted last month of a partially frozen Lake Michigan sent shivers down our spines. Then when we heard today that the ice cover on the Great Lakes is approaching a record, we went in search of other such images. After looking through several dozen, we need some hot cocoa. See if you agree. According to the National Oceanic and Atmospheric Administration, as of Thursday 88.4 percent of the lakes' total surface area was considered to be ice-covered. In the record books, as USA Today says, that's closing in on the all-time high of 95 percent, set in February 1979. -- Lake Erie, 95.8 percent. -- Lake Huron, 95.5 percent. -- Lake Superior, 94.6 percent. -- Lake Michigan, 82.3 percent. -- Lake Ontario, 43.4 percent. Another satellite image, with state lines superimposed on it, taken on Friday. -- Lake Erie, 62 feet / 210 feet. -- Lake Huron, 195 feet / 750 feet. -- Lake Michigan, 279 feet / 925 feet. -- Lake Ontario, 283 feet / 802 feet. -- Lake Superior, 483 feet / 1,332 feet. But enough with the statistics. Let's let the pictures tell the story. This photo was taken on Dec. 12, so ice hadn't yet built up. But it shows how cold air descending from Canada blows over the lakes.